The Pressmatic dispensers have an innovative design that maximises safety and ease of use. A recirculation valve means that reagent used for priming is delivered straight back into the bottle making it safer and less wasteful. Once the dispenser has been fitted to the bottle, it is fully rotational for optimum positioning. The precise volume setting is by a self-locking rotating ring that is robust, easy to use and will not move during operation. The piston is manufactured from high-grade ceramic eliminating abrasion and sticking. The liquid pathway is made up of glass, PTFE and ceramic to give outstanding chemical resistance. The whole unit can be autoclaved without dismantling. Each Pressmatic dispenser is supplied with 3 x bottle adapters to fit most types of vessel and a works calibrated certificate. A full range of spare parts are available. The new Pressmatic HF dispenser has been specially designed for use with highly aggressive liquids such as hydrofluoric acid. A recirculation valve means that reagent used for priming is delivered safely back into the bottle. The piston, barrel, valve block and tubes are manufactured from chemically inert ceramic and PTFE. 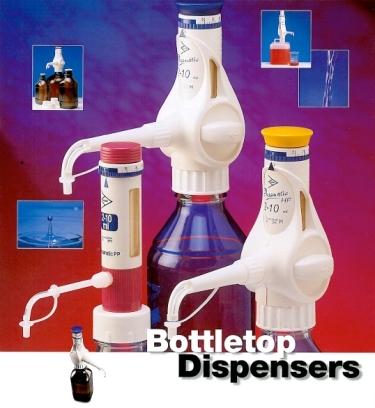 Once the dispenser has been fitted to the bottle, it is fully rotational for optimum positioning. The precise volume setting is by a self-locking rotating ring that is robust, easy to use and will not move during operation. The unit is simple to take apart for cleaning purposes and all valves are fully replaceable. Each Pressmatic HF dispenser is supplied with 3 x bottle adapters and a works calibrated certificate. Models in this range include the PD10P, PD60P, PD1R, PD2R, PD5R, PD10R, PD30R, PD60R and PD10R/HF.